Emily and Elias Jessup left their home in southern Texas, tired of living a life of poverty. They soon find out that life is no better alone on their own. With not a penny to their name and no job prospects, the siblings turn to stealing from the rich to survive. Cade Singleton heard stories of the Jessup siblings preying on the rich. When the bounty is increased high enough to entice him into pursuing them, he wants nothing better than to make them see justice. Will Cade be able to bring the Jessup siblings to justice? Will the Jessup siblings finally find redemption from their thieving ways? To help me delve into this historical bounty hunter romance, Ginny Sterling, the author behind these ‘Lawfully Yours’ has set aside a little time to chat about what we might be able to expect in this adventure. Ginny, I’ve been reading for a long time now but I haven’t come across a historical bounty hunter romance before. What sparked your interest to write about this little-explored world? *Laughs* I love that you’ve turned those sibling antics that so many of us are familiar with into something productive, although many of those fights seemed important at the time! Do you find that writing about the important things in life, like sibling dynamics, energizes or exhausts you when you write? Energize! I adore having time to sit down and lose myself in a story. What writing projects are you currently losing yourself in? I am working heavily on several books in the Lawkeepers series, as well as my Bride series and Brokken Road Romances releasing in June 2018. Wow, you are busy! I love busy authors, they always have a fantastic imagination. Let’s see if we can get your imagination kicked into gear with a few slightly sillier questions before you return to lose yourself in your projects. And with so many writing projects under your belt, you must have a favourite word. What is it? *Laughs* Top choice! It’s just so versatile for expressing joy and those positive things in life. Are you left or right-handed? That was an easy one. I hope the next one is a little harder. Can you tell me if you invented a monster what would it look like and what would you call it? A tarantula. Huge, massively furry and intimidating because of his smile. His name is Joey. How huge are we talking here? I’m thinking any spider bigger than the size of a dog would be very intimidating to me, but maybe it needs to be bigger than a car to get a reader properly scared. Either way, I wouldn’t want to meet Joey in the street! What do you think happens if Batman gets bitten by a vampire? Poor Batman! If I was him, I’d rather get bitten by Joey instead! I’m really liking the idea of integrating Joey into on of your stories, so I’m going to ask you a final question before I let you go so you can start writing about our favourite tarantula. Looking back on all of the words, sentences and phrases in ‘Lawfully Yours’, which one is your favourite? *Laughs* Well, that line certainly doesn’t give the ending away, but it does show a touch of humour is hiding in those pages. Ginny, as promised I’ll leave you now to write an epic saga about Joey, and one day soon I hope I get to chat to you again about the next instalment in the Lawkeeper romance series! Excited to read the book we discussed today? Find it here on Amazon: ‘Lawfully Yours: Inspirational Christian Historical (A Bounty Hunter Lawkeeper Romance) ( ASIN: B079Z2NGLY )‘. 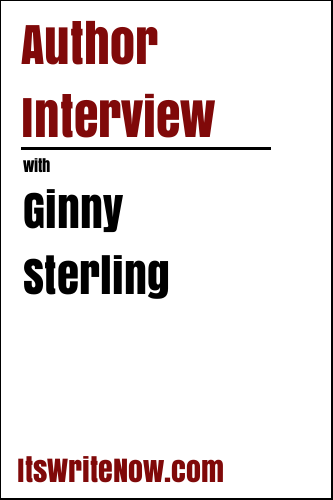 Want to find out more about Ginny Sterling? Connect here!